It was frantic, it had moments of quality and it was tense. 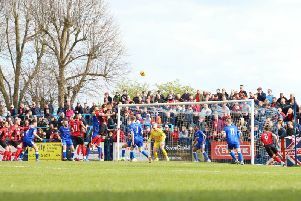 Indeed, Kettering Town and Leamington served up a very watchable encounter at Latimer Park as the battle for the play-off places in the Evo-Stik Southern League Premier Division heads for boiling point. In the end, a 1-1 draw didn’t do either side much harm, although the Poppies did drop out of the top five after Hungerford Town claimed a late winner at King’s Lynn Town. But Kettering will get their chance to go above both Leamington and Hungerford if they can beat already-relegated Bedworth United in the latest of their big run of matches in less than 48 hours. With the finishing line fast approaching, someone is going to miss out. But Marcus Law’s team, who extended their unbeaten run to 11 matches with this stalemate, once again proved they belong in the upper reaches of the table. Not for the first time, they more than matched a team higher than them. The Poppies will argue they did enough to win this one but they did, at times, lack a cutting edge that was needed to unlock a determined Leamington defence. And Kettering will also point to the game’s big talking point when the Brakes levelled from a hotly-disputed penalty on the stroke of half-time. Leamington actually started the better and Jack Edwards had an early effort blocked before shooting over from close-range. But the Poppies opened the scoring with their first real venture into the visiting penalty area. Rene Howe picked the lock on this occasion as he played in Liam Canavan. His first effort was brilliantly stopped by Tony Breeden - a pantomime villain to the home fans if ever there was one. Breeden reacted well to also save the follow-up but it was third time lucky for Canavan as he managed to force the loose ball over the line. Canavan found the side-netting with another half-chance before the moment of controversy arrived. There wasn’t much doubt about the foul as Chris Carruthers brought down former Kettering man Courtney Baker-Richardson. But the Poppies players were adamant the incident happened outside the area. However, after consulting with his assistant, referee Wayne Carter stuck with his original decision to award a spot-kick, which was duly converted by Sam Austin. Kettering, no doubt feeling hard done by, were out of the traps quickly in the second half. And Breeden was the busier of the two goalkeepers as he punched away a fierce long-range effort from James Brighton before producing a better reaction save from Canavan after he had been teed up by David Popa. The Poppies continued to look the more likely to nick a winner and they really should have done so late on when Wilson Carvalho blasted over the bar from a good position after he received a pass from Howe. Alas, on this occasion it wasn’t to be. News of Hungerford’s late winner dampened the mood somewhat but the truth is Kettering’s fate remains firmly in their own hands. Two games in 48 hours from Thursday against two teams who have been relegated gives them the chance to stamp their mark on the top five. Poppies: Hill; Bateman, Solkhon, Carruthers, Langdon; Carvalho, Pepe-N’Goma, Canavan (sub Obeng, 82 mins), Brighton; Popa (sub Grocott, 70 mins), Howe (sub Stephens, 86 mins). Subs not used: Baker, Cotton. Leamington: Breeden; Taundry, Tank, Magunda (sub George, 22 mins), Gudger (sub Elvins, h-t); Halsall, Gittings; Moore, Edwards, Austin; Baker-Richardson (sub Mackey, 74 mins). Subs not used: Ogleby, Oulton. Goals: Canavan (14 mins, 1-0), Austin pen (44 mins, 1-1).